There are two things in this world that bring out the kid in me. (Well, maybe more than two, but just we are going to talk about these two today.) Rice Krispie Treats and Candy Corn. So why not bring the two classic favorite treats together in a deliciously sweet Halloween treat? Just a few ingredients and a swirl or two of bright Halloween color and you have yourself a fun dessert recipe for your holiday parties. When I was a kid, crisp rice cereal was one of my favorites. I can remember mornings (and maybe a few afternoons) at my Papa and Granny’s house eating yummy bowls of this stuff. Then, of course, someone had to be all Genius Level and mix them up with the pure-sugar delight that is the marshmallow. And…butter. That genius was Ms. Mildred Day, an employee of Kellogg. Did you know she developed the recipe back in the 1930’s as part of a fundraiser for the Camp Fire Girls Group? True story. 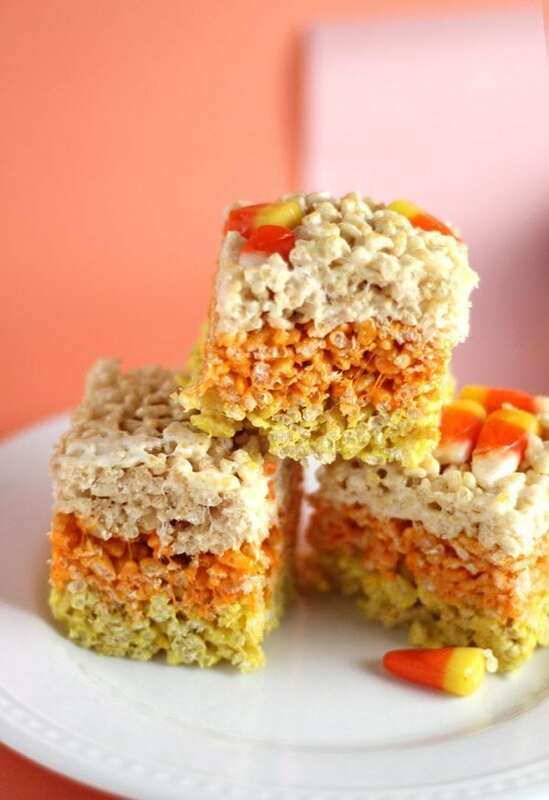 Our Candy Corn Rice Krispie Treats start with the basic recipe. You can use a baking dish if you’d like. We went with a plastic rectangular container. Why? It bends and flexes and made removing the rice krispies a breeze. Once the first “white” layer is finished, rinse out the pot and start with a fresh batch. 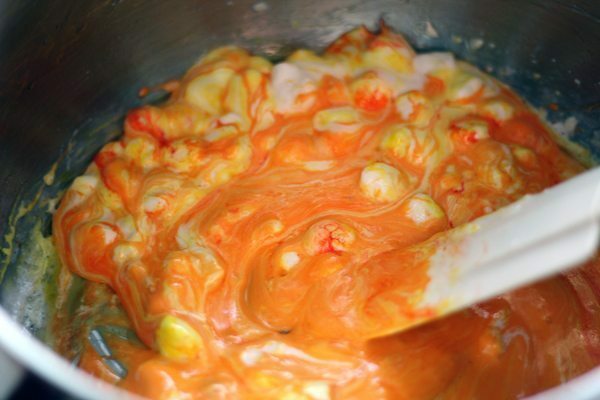 This time, we are going to tint the melted marshmallow and butter mixture bright orange. Just like the center of your favorite candy corn. You can easily make all kinds of treats: Red White and Blue Patriotic Treats, Galaxy Swirl, Monster Mash…the possibilities are limited only by your imagination. Looking for a Savory Halloween Recipe? Once the orange batch is done, repeat the same steps with yellow. Let cool completely, cut and serve. These are best served fresh. Store covered. Aren’t these fun? And so simple. 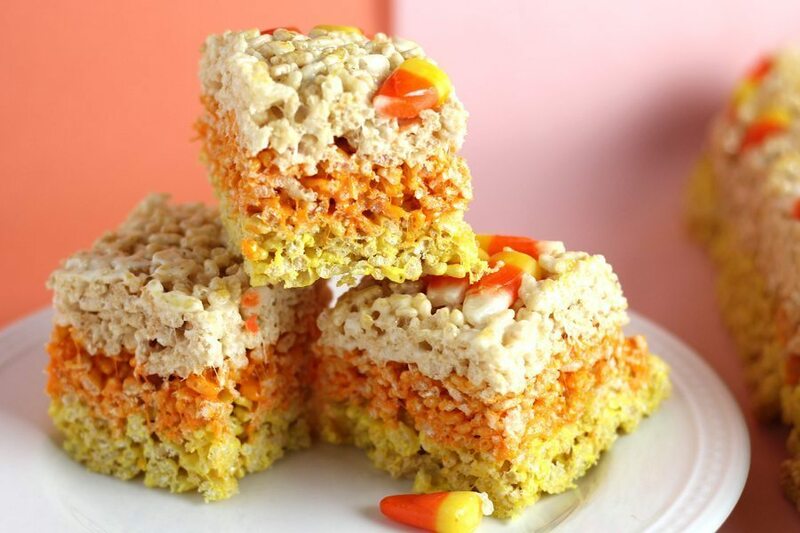 Your Halloween just got a whole lot sweeter with Candy Corn Rice Krispie Treats. Work in batches for each color. Spray a 9x13 baking dish or plastic rectangular container with butter flavored non-stick spray. Set aside. Cut the stick of butter into thirds. In a large sauce pan, melt one third of the butter over low heat. Stir in one third of the salt. Add one third of the marshmallows. Cook and stir constantly until the marshmallows are melted completely. 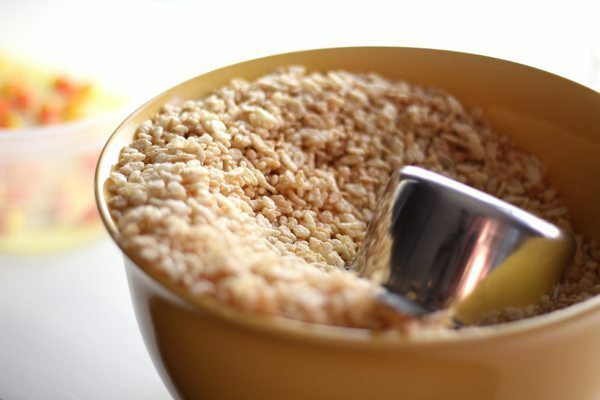 Remove from heat and stir in 4 cups of the cereal. Stir to combine well. Spoon into the prepared dish. Using a sheet of wax paper lightly coated with spray, press the layer of cereal mixture evenly. Rinse the pot well. Repeat the process. During the marshmallow melting, stir in desired amount of orange food coloring. Stir completely until the color is even. Continue the process as before. Rinse the pot and repeat the process, this time with yellow food color. Allow the Candy Corn Rice Krispies to cool completely. Invert and cut into squares. Serve fresh or store in a tightly sealed container. I LOVE how you made these into colored layers just like the candy! So fun – I bet they are delicious! Thank you! They turned out pretty tasty. And by pretty tasty I mean I ate four. I love that there are layers that look like candy corn! My kids love candy corn so this is so perfect! Thanks! Just a tiny dab of gel color did the trick. Next time I am going to experiment by layering in some flavors. There really is NO resisting a good rice krispy square is there?! I absolutely LOVE your version, candy corn is one of my fave Halloween treats, I have to make these when I buy my annual package of it!!! Thanks! I, too, have an addiction to the candy corn. These are so fun! I love the idea of these being tri color, with the candy corn on top. Love these! Thank you, Joanna. They turned out great. As you said not just kids, even we would love to dig into these delicious looking bars!..what a fantastic snack to enjoy.. The little bit of salt we added made them extra special. 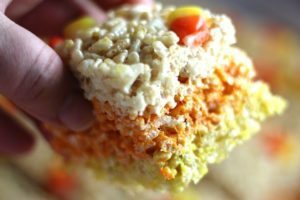 I love making the traditional rice krispie treat into this colorful treat. It will be a fun activity to make with my kids. Looks so cute! Thank you, Sandhya. They were a lot of fun to make. The color possibilities are endless. These are so cute.. I love the colors. Will make a perfect halloween treat I think. 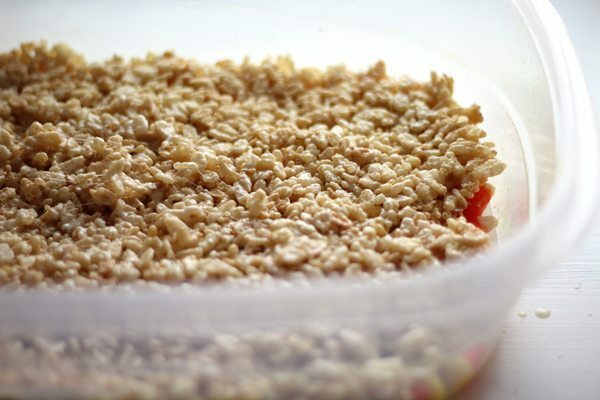 My kids love rice krispy treats so these will disappear instantly. Will try them soon. Pinning for later. This is fun treat to give to trick o treaters, I am going to make some ahead as kids love it. I always make some homemade treat for trick o treat. This sound perfect . 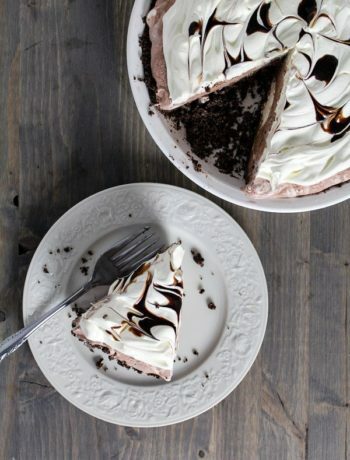 I like the layer effect you have in this recipe. This is one of those Halloween treats that is going to please the adults and the kids and everybody … especially the cook, since it’s simple to put together. Trick or Treat?! Super easy to pull off. Hardest part? Washing the pot between colors. These look DELICIOUS! I’m pretty obsessed with candy corn this time of year, so these are perfect. Definitely want to make these on Halloween! Next time I am going to try these with the colors of Indian Corn. How fun! These look wonderful! 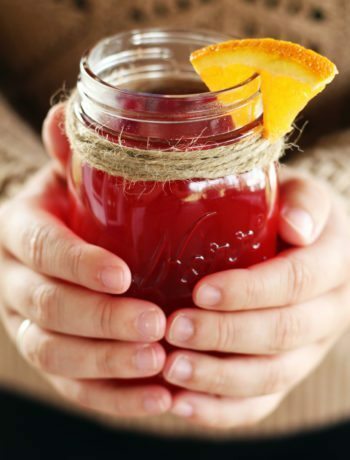 I love the different colors in layers…fun and festive! Thank you so much, Catherine. They are bright and perfect for the upcoming Halloween holiday. Thank you Ashley! We must be dessert twins. 🙂 Love yours, too. The colors!